This is my first month participating in Progressive Eats, a virtual version of a Progressive Dinner Party. This month is hosted by Coleen Hill, the author of The Redhead Baker. 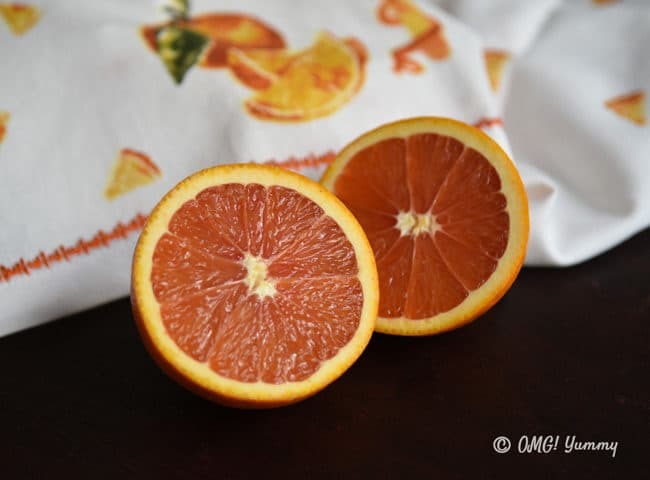 We’re featuring dishes with a citrus theme. At the end of the post you will find all the delicious recipes including drinks, appetizers, main course, sides dishes and dessert! Every Friday night, Jews around the world celebrate Shabbat. At sundown, 24 hours of rest and reflection begin in a ritualistic way – with candle lighting, breaking and sharing of the challah bread, and blessing and drinking of the wine. What’s not to love? Traditionally, a home-cooked dinner with fresh baked bread is served on Friday night, prepared before sundown. But modern frenetic life gets in the way of this wonderful ritual. In reality, many of us just want to go out for dinner or order in pizza by the time Friday rolls along. And making challah bread from scratch that requires two rises? That just isn’t realistic in most busy homes. This bread is the solution. 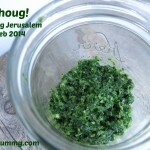 I learned how to make it from the doyenne of Jewish cooking, Joan Nathan, in a private cooking class at the home of my friend and fellow blogger, Dana of Foodie Goes Healthy. Joan learned this recipe in France while writing her cookbook Quiches, Kugels, and Couscous. And what a revelation it is. We managed to make this bread in the course of the cooking class from dough prep to fully baked while prepping three other dishes. Why? You can make the dough in a mixer, let it rest for ten minutes, form it into a loaf and put it straight into the oven. Really! And it works every time. A Sneak Peek into our Cooking Class: Joan explains a 6-strand braid! Have time to make the dough but not bake it? No problem, form the loaf, cover it with plastic wrap and put it in the refrigerator. Bake it later. Or put the dough in the fridge unformed, take it out later and form it, egg wash it, and bake it. I was skeptical when I first saw anise in the recipe. Anise tastes like licorice, which was not my favorite flavor. My taste buds have evolved. In this bread, it perfectly compliments the eggy sweetness in an almost mystical way, nearly disappearing during the baking process. Most people taste the bread and can’t quite place the flavor but can’t stop eating it. Be sure to buy anise and not star anise, which is a spice that actually looks like a star and is often used in Chinese cooking. My contribution to this recipe is the addition of orange. It occurred to me that anise and orange would marry well together – confirmed by a quick look in The Flavor Bible and yes, a quick Google search. And while I described challah bread as ritualistic for Shabbat, I think we under-use this eggy loaf when considering what bread to serve with any meal. It’s wonderful for sopping up extra juices and receives butter beautifully. Did I mention leftovers make the best French toast and bread pudding you will ever eat? For this orange version of the loaf, I reduced the amount of anise from the original recipe to allow the orange to shine a bit more. I also used Cara Cara oranges because they were available, but it is not necessary – do not run from store to store trying to find them. Any orange will do the trick. As for the seeds on top – Joan taught us how to make those fun circular dots but you can skip the seeds entirely, use different seeds, or just sprinkle them on. I incorporate a seed called nigella along with the light sesame seeds. They are often used in Middle Eastern and Indian cooking (you’ll see them in Indian stores labeled “kalonji”). Poppy would work well too and is the more obvious choice. Bread is often called the staff of life. I just know it makes the house smell good, warms your soul, and always brings people to the table. Don’t let time stand in your way. 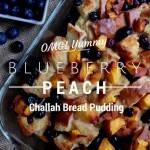 Try this recipe and you’ll be baking bread every week whether you celebrate Shabbat or not. 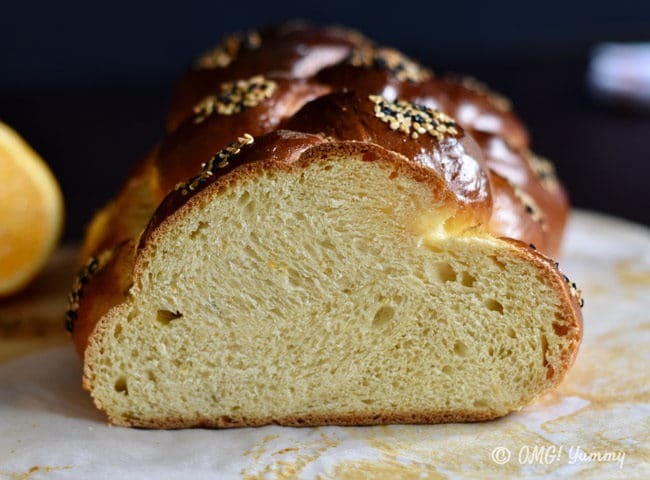 This no-rise orange and anise-scented challah is so easy to prepare, you'll find yourself making homemade bread any day of the week. Don't let the long instructions scare you - I just included various alternatives in timing and process. The basic instructions are: make the dough, braid the dough, bake the dough. Notice that you don't have to let it rise even once, let alone twice. And if you do let it rise for a little while, that's ok too. Position oven racks in the upper and lower thirds of the oven if you plan to bake two loaves at once or in the center of the oven for one; preheat to 375 degrees, and line 1 or 2 large baking sheets with parchment paper. Prep your orange juice and zest. To make a full tablespoon of zest you’ll probably need to zest more than one orange, depending on the size. If you zest both and have extra zest, you can put the excess in a small container or Ziploc bag and freeze it for future use. Squeeze the juice from the oranges – it should come close to 1 cup. If not, you can add store-bought orange juice to make a cup or just use a bit of extra water. Add hot water to the orange juice to equal up to two cups. Mixing the hot water with the cold juice should yield lukewarm liquid, which is what you want to mix with the yeast. Put the yeast in the bowl of a stand mixer equipped with a dough hook, and pour in the orange juice and water. Whisk it (by hand) so the yeast dissolves. Let this stand for a couple of minutes to be sure you see some bubbles or action in the yeast mixture so you know your yeast is alive and well. Then whisk in (by hand) the 2 eggs, and the oil. 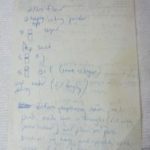 Add 7 cups of the flour, the salt, sugar, anise seeds, and orange zest to the bowl, and beat with the dough hook for a few minutes, until the dough is smooth and elastic, adding flour as necessary. I always end up using just the 7 cups of flour. In my heavy duty mixer, it takes only a minute or two for the dough to come together. But don’t go by time, go by look and feel. Smooth and elastic. If you poke it, does it spring back? Does it feel smooth or wet and sticky? If too wet and sticky, add a bit more flour. Remove the dough from the mixer bowl, form into a round loaf, then poke a 1-inch hole all the way through the center. Let the dough rest uncovered on a floured surface for about 10 minutes. If needed, re-flour the work surface. Flour your hands. If you made 6 equal pieces, roll each piece of dough into a rope about 14 inches long. I form the dough into a cylinder then roll it out with the palms of my hands to about 14 inches long. If it’s uneven, I just squish it with my hands to even it out a bit but it doesn’t have to be perfect. Really. Repeat with all 6 pieces so you have 6 ropes of dough. Now you can create two loaves of 3 stranded braids each or one large loaf using the 6 strand braid method. 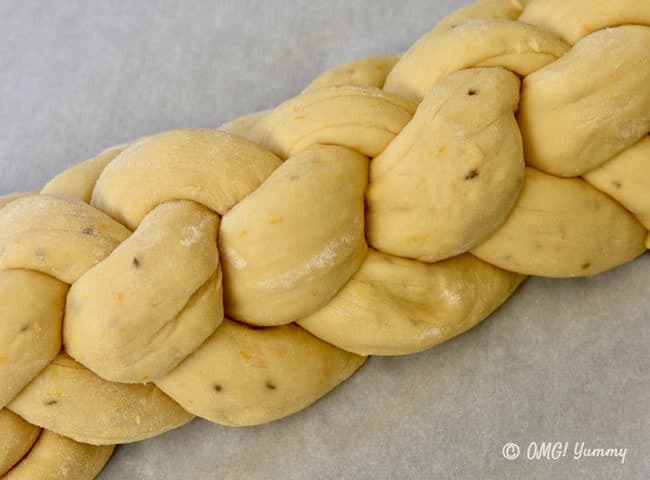 If you divided the dough into 3 equal pieces, roll out each piece into a rope about 20 inches long. 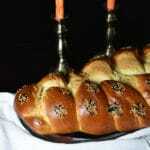 Now braid your challah – whether doing 3 strands or 6, start by pressing together the ends of the strands at one end. Then braid as you would braid someone’s hair until you reach the end of the strands. Then squish the ends together and fold under if you want to hide them. 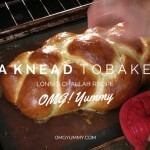 Move the braided loaf onto the parchment lined baking tray. Don’t be afraid to manipulate the loaf to even it out. It all ends up looking beautiful no matter what! If you want to do a 6-stranded braid, I included the video of Joan teaching us how to do it in my blog post above. Beat the extra egg in a bowl and brush it all over the loaves. Sprinkle the seeds on top or put your mixture of seeds into a small bowl. Then dip your finger into the leftover egg mixture, then into the seeds, then place the seeded finger onto the loaf to create the dots. It’s fun and looks great but if you are short on time, just sprinkle the seeds on and that will look fantastic as well. Bake for 10 minutes at 375 degrees, then reduce the temperature to 350 degrees and bake for 30 minutes longer. If baking two loaves at once, 15 minutes into the 350 degree baking time, rotate the baking sheets top to bottom and front to back. Bake for 15 minutes more, or until the loaves sound hollow when tapped. 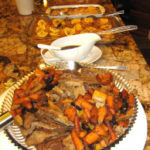 A progressive dinner involves going from house to house, enjoying a different course at each location. With Progressive Eats, a theme is chosen each month, members share recipes suitable for a delicious meal or party, and you can hop from blog to blog to check them out. You are very talented and creative! thanks for sharing. Awwww thanks Britni! If I can do it (formerly doughaphobic haha) – anyone can! I love the simplicity of not having to worry about a second rise! What a fabulous short cut, and of course I swoon for your braiding ability! Thanks so much Sara! It really is stress relieving to shorten the process. The other day I was able to let it rise for just a half hour cuz I wasn’t ready to bake it yet and that worked too. So flexible! I bet your home smells incredible when you make this. How wonderful to find an easier way to make something so beautiful! Thanks Helen! I made it for a big dinner party Saturday night and it was so flexible to my busy cooking schedule without a double rise, or really any need for a rise at all. And yes, the house smells good – nothing like the smell of bread baking! Such a lovely loaf and the citrus flavor is spot on. Thank you Robin. I will be making this in the round and I put a small bowl in the center to add in honey. (Not my original idea but it’s a good one!) A great presentation. Hey Beth…oops I appear to have totally missed this last month and am so glad I found it today. 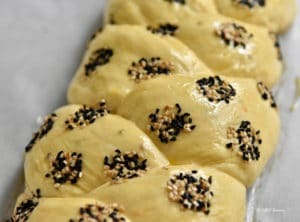 I am a newbie to making Challah but I love it SO much and this version sounds totally fantastic. It is now on my list! Well with my posting problems it is no wonder you missed it. Today I got the 3AM right but the auto schedule didn’t work! What!!!! You are so skilled in the kitchen – you will nail this loaf. And probably come up with another great rendition. Glad to be part of such a kind and talented group. Thanks for having me. Anise is one of my favourite flavourings, especially of bread. This recipe is definitely on my list! Thank you! If you make it, let me know how it turns out and what you think of the flavor combo. The bread is great for breakfast and sandwiches also. Such a gorgeous challah! The combination of orange and anise is intoxicating! Thanks Deb – I can totally see you combining the two flavors in one of your baking masterpieces! What a stunning challah, Beth! And even more so knowing it’s no knead. 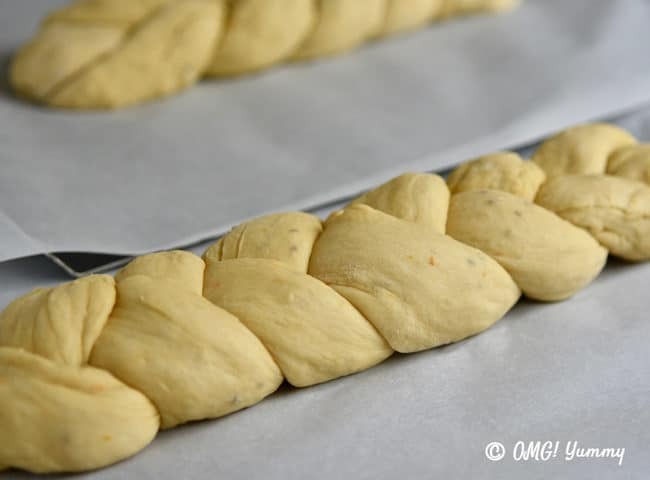 Who knew challah could be made so quickly?! The anise and orange pairing sounds terrific, too (love the Flavor Bible!). 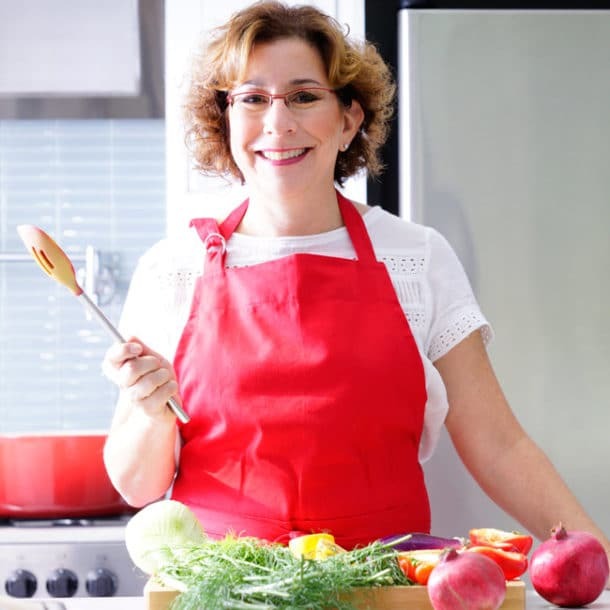 I’m so happy you could cook with Joan Nathan and even happier you’re sharing tips with us. Cooking with Joan and my Dana was definitely a highlight of 2016. I’m hoping that cooking with you will be a highlight of 2017 – somehow!!! Let me know if you try it! And how it turns out. Love this recipe and am so grateful that I had the chance to learn it from Joan and can now keep creating with the original idea. I love this! I have been putting off making bread because of the rising time, etc. This looks like one I will be making soon. Hi Lisa – thanks for stopping by. I always love meeting a Jersey Girl! I grew up on the east coast and still have family in Jersey! Yes, the rising time is what often keeps me from baking – just can’t get my schedule quite right. Hope you give it a try! This is so beautiful! I can’t believe it’s no rise! I am definitely giving this one a try!!! You’re a bread expert – can’t wait to hear your feedback! I love the idea of you using this for a class – it’s perfect for minimal time spans. Re the mixer – heavy duty makes it go quickly but a regular one or I bet cuisinart with a dough blade could work as well. Keep me posted! What an absolutely gorgeous loaf of challah! Anise is one of my favorite flavorings, especially in breads and pastries, so I know I want to try this. It took me a while to get on board with anise but now I am a big fan! How long can you leave the dough (either braided or not) in the refrigerator before baking? If only hours, can you give me some hints for how to make it several days ahead? Hi Leslie! I did leave it overnight on one of my bakes and it was fine. I think up to 24 hours is fine, maybe even 48 but not longer in the fridge. The other option Joan mentioned as does the well known bread in 5 minutes a day folks, is to freeze the dough. They say an enriched dough will last about 3 weeks in the freezer without affecting it. Just be sure it is wrapped well and I would completely defrost it before I would bake it. 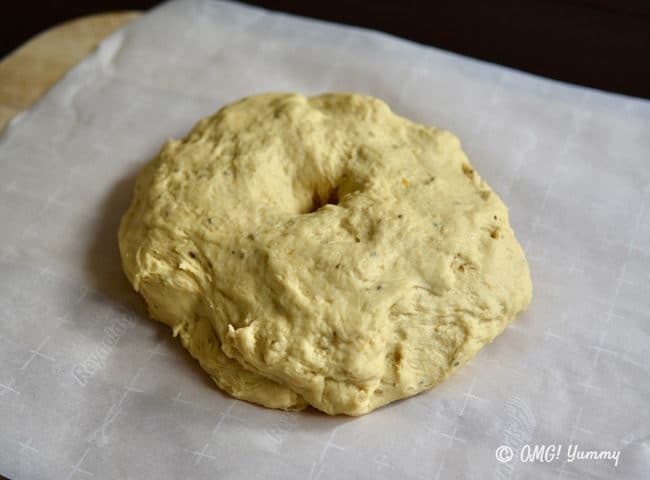 I suspect you can freeze the unformed or formed dough but I think it would be great if it was already braided so all you have to do is defrost, egg wash, and bake. You can. You can. That’s the beauty of it! What a gorgeous loaf this is, Beth! I’m really interested in the no-rise concept and plan to try it as soon as I get re-settled up in Tahoe. I bake a lot of bread, and want to see how this works for me too!! I’ll be anxious to hear from you since you bake a lot of bread. I was incredulous at best at the cooking class but it worked. And has worked each time since and if I’ve let it rise a bit, that was ok too. My kind of bread recipe! Welcome to the group, Beth! What a great post! 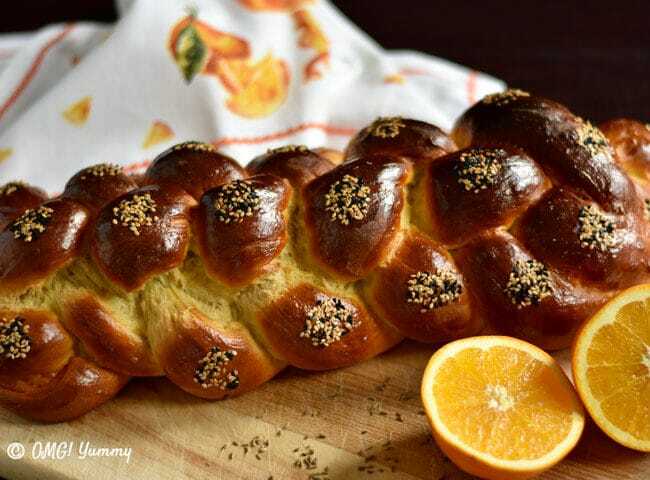 Loving the “fast” challah, the orange/anise combo and the perfect burnished color of your finished loaf. I find myself turning to The Flavor Bible too when I’m working out variations on recipes–such a fantastic resource! yup – the flavor bible is a life saver either when the creative brain is dead or you just don’t believe that an idea makes sense. I was so concerned that I had slightly overcooked this loaf but my son admonished me several times that it was perfect. I am my own worst critic! 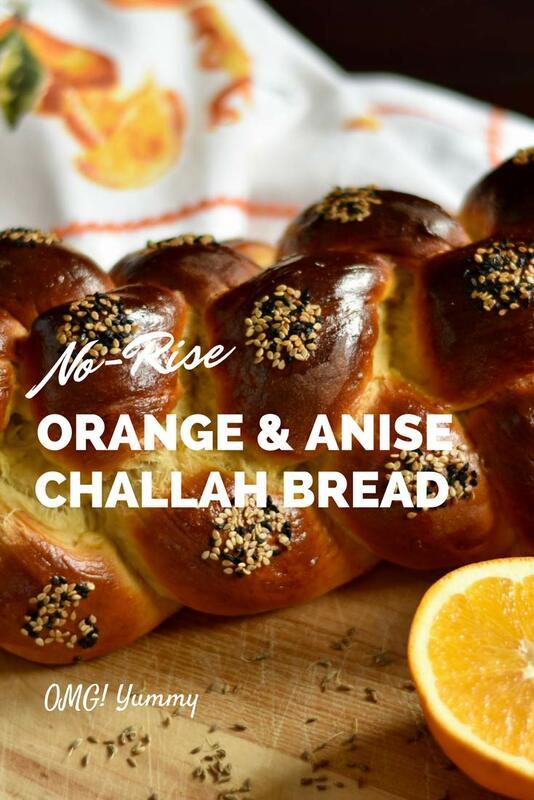 I love the addition of orange to this challah. 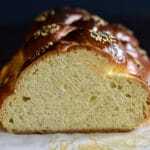 I never would have thought to put anise in challah, but I can vouch that the flavor is subtle and so delicious in the baked bread. It’s good to know that the recipe is flexible and can be “parked” and continued at different points. Also, your detailed instructions are helpful and love your photos. Can’t wait to bake this soon. If you try it you have to tell me what you think. I still can’t believe how easy this bread is to make but I never would have know if not for you! I love the flavor of anise but I don’t like licorice. I never tried using it in a challah before, but now I must. Spectacular loaf and thank you for the video on technique. Definitely give it a try – it’s so fun to see how it changes when baked and it’s an easy bread to make! This is the MOST gorgeous challah I’ve ever seen! And lucky you having a lesson from Joan Nathan. I would have been skeptical about the anise, too, but I’m glad you took the risk as this is one outstanding loaf!!! Coming from you, I take it as a huge compliment. And yes, that was a bucket list day in the kitchen with Joan for sure!